I woke up early filled with anticipation of another day of great music. I started my morning with a drive to Carmel Beach. The sun was out and it was getting warm early which meant another day of great weather. The waves were magnificent and I got a little wet during my walk along the ocean but it was very calming and peaceful. Next up, I visited the Monterey Bay Aquarium. They have a wonderful assortment of fish, marine life, and even birds and the jellyfish exhibit is spectacular. It was about 7:15pm when I got in line for Carla Cook’s 8:30pm show at Dizzy’s Den. I think people started lining much earlier because I was way back in the line. Security assured everyone that we would all be able to get a seat for this much anticipated performance. I missed seeing Carla in Chicago last year so this evening was definitely special for me. A few minutes before the show, I got to go backstage and chat with Carla. I stuttered at first from the excitement and eventually got my words together. She looked radiant and was ready to give an outstanding show. She was just as warm in person as she is in her music and it was really fun meeting her. Carla and her quintet opened swinging brightly on “Until I Met You (Corner Pocket)“, an adaptation of the Count Basie signature piece and paid tribute to vocalese performer Eddie Jefferson with “Oh Gee” where she demonstrated her innate ability to vocalize as a horn. She told how the popular standard “Where or When” came to her late yet she brought a beautiful freshness to it with her wonderful vocal clarity. She dedicated the jazzy “Strong Man” as a salute to all the strong men. Bassist Lonnie Plaxico switched from upright bass to the bass guitar for Carla’s soulful rendition of the Marvin Gaye classic “Inner City Blues” then she took us straight into Sunday morning with “Hold to God’s Unchanging Hand.” Percussionist Abdou Mboup worked it out on the bongos as Carla sang brilliantly in Portuguese on “Cancao do Sal“. She closed with a gospel-tinged, soulful version of Eric Clapton’s “If I Could Change the World” on which she gave us a powerful extended note toward the end of the song. Pianist Darryl Ivey framed Carla vocals to perfection and providing outstanding solos throughout the evening. Israel Bannerman kept a fascinating rhythm on the drums. With such clearness, versatility, and style, Carla has the ability to make any song special. Carla’s latest recording on MAXJAZZ Records is Simply Natural. I popped in to catch the tail end of singer/pianist Dena DeRose’s second set in the Coffee House Gallery. She accompanies herself very well and has a smoldering voice that clothes each note. Like Shirley Horn, she uses spacing in her notes and silence to convey a message just as a powerful as when she sings. Her vocals were quite smooth on the reflective “I’m Old Fashioned” and poignant “You’ve Changed.” Dena introduced her own recently composed swinging instrumental, “One for the Road.” I definitely want to hear more of her music. Her trio included Michael Zisman on bass and Matt Wilson on drums. 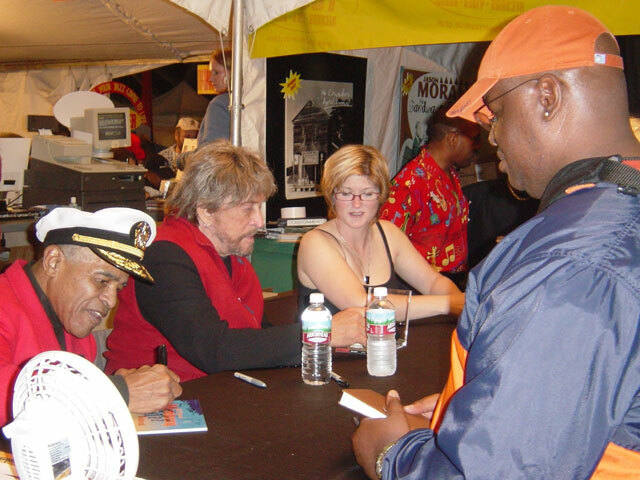 After her set, she signed autographs with legendary vocalists Jon Hendricks and Mark Murphy at the Tower Records on the festival grounds. Vocalist/Vocalese Kurt Elling has the amazing ability to glide vocally through air with such ease. He challenges the boundaries of music with his original lyrics set to the compositions of the such jazz greats as Coltrane, Gordon, Zawinul, and Shorter. He breathes new life into these classics and gives the listener a renewed appreciation. Kurt played the late show at Dizzy’s Den to a fairly packed house. He was playful and full of energy in his music. He was wonderfully accompanied by the Laurence Hobgood Trio featuring Hobgood on piano, Rob Amster on bass, and Frank Parker, Jr. on drums. I have been a fan of Kurt since first hearing him on a Yellowjackets album several years ago so seeing him live was definitely a treat. His set included the vocal adaptations of “In The Winelight” (Grover Washington, Jr.), “Tanya Jean” (Dexter Gordon), “When Somebody Needs You“, “Never My Love” (The Association), “Minuano” (Pat Metheny), and one of my favorites, “Man in the Air” which is also the title track from his latest Blue Note album, Man in the Air. He closed with his vocalese of the Coltrane classic “Resolution.” Kurt kept us captivated as he took us through the highs and lows of his vocal terrain. In the middle of his set, he recited a poem from Robert Creely while accompanied softly by his trio. He displays such versatility in his music and has a great sense of humor as well. He is definitely a modern day keeper of the spirited vocalese tradition made popular by such legends as Jon Hendricks and Eddie Jefferson. This entry was posted on Tuesday, September 30th, 2003 at 6:12 am. It is filed under Monterey Jazz Festival. You can follow any responses to this entry through the RSS 2.0 feed. Thanks for the marvelous review! Sounds incredible. Alligator on a stick: I had that in N’Awlins. great reviews. you know i’m so diggin’ that you saw kurt elling. yes, i am living vicariously through you so keep on livin’. I adore Carla. What will be the results of these backstage chats you keep having? one of these days, i’ll catch up to what you’re doing. you go on and live that exciting life, you! Ooh, if my life could only be this exciting! I’m turning that horrid shade of green again. Maybe I’ll be the Hulk for Halloween. LOL. Uncle Jimmy, I can see the hard work you put into the reviews and I know it was not easy getting all of this done. Great job, perhaps a minor wardrobe suggestion, Uncle dear, orange may not be the best fall color for you. Keep up the reviews, despite myself you are starting to fuel my interest in jazz.